Peeps Cupcake Funfetti Pancakes at Naomi’s Cafe in Northfield can be enjoyed by kids of all ages. With spring blooms come Easter celebrations. While many celebrate this holiday with age-old traditions, some area eateries are putting their own twist on Easter revelries. “Holidays are built on traditions, but that doesn’t mean you can’t have fun with them,” says Melinda Shriver, owner of Naomi’s Café in Northfield. From breakfast to dinner, Easter traditions are getting a boost at these area restaurants. Pancakes with a side of whimsy will be served all weekend long at Naomi’s Cafe. “Spring and Easter is a fun, colorful time of year, so that’s what we wanted to offer with our specials,” Shriver says. Naomi’s Café specializes in unique pancakes as well as delicious breakfast and lunch options. Their festive Easter specialties include bunny pancakes ($4.99), Peep’s cupcake pancakes ($5.99) and the hatched Easter egg pancake and scrambled egg ($3.99). 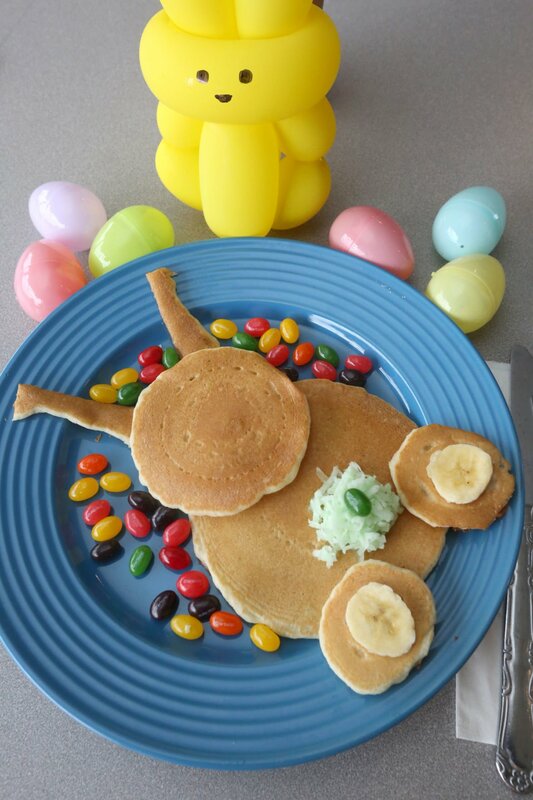 The Easter Bunny loves Naomi’s Café’s pancakes so much that he will even hop on over Saturday and Sunday, April 20 and 21. Naomi’s Café is open from 7 a.m. to 3 p.m. daily. “When you think about Easter, you think about a basket full of candy. So that’s what we wanted to do with our latte drinks,” says Patty Talese, owner of Jon & Patty’s Coffee Bar and Bistro. Jon & Patty’s lattes are just about guaranteed to bring out your inner child on Easter morning. Your favorite Easter memories have been whipped and steamed into a unique morning treat. With selections such as the Peep’s latte with toasted marshmallow and vanilla; the white bunny latte with white chocolate and vanilla; the jelly bean latte with cherry and vanilla; and the Cadbury egg latte with chocolate and vanilla — you won’t need to raid your kid’s Easter basket! Jon & Patty’s will also be offering a special Easter Dinner from 4 to 8 p.m. on Sunday, April 21. Reservations are strongly recommended. Full of rich traditions, Renault Winery will celebrate Easter with a new take on some of the holiday’s favorite dishes and a whole basket of changes. In particular, Renault is offering a fresh take on the brunch staple salmon. Inspired by the classic lox breakfast, Renault will feature lemon-crusted grilled salmon, served over a potato pancake and topped with asparagus. Renault will also offer wine tastings on Easter. “It’s an exciting time here at Renault during the first phase of a multi-million dollar renovation and a focus on getting back to authenticity. That’s something as a chef I appreciate, especially when it comes to big, holiday meals, like Easter. It’s a time to celebrate tradition — but no one said you couldn’t add your own fresh take to the classic dishes,” says Chef Paul Drew, director of culinary operations at Renault Winery. Easter Brunch will be served in their newly renovated Chateau Ballroom from 10 a.m. to 3 p.m. Adults are $38.95 and kids ages 3 to 10 are $18.95. Wine Tastings will be offered from 11 a.m. to 4 p.m. Located at 72 N. Bremen Ave. in Egg Harbor City. For more information call 609-965-2111 or go to RenaultWinery.com. As one of the most traditional Easter dishes, ham can be found on many Easter menus. However, Gallagher’s Steakhouse at Resorts Casino Hotel is kicking up the classic ham dinner with a unique jalapeno-honey glaze to be enjoyed with scalloped potatoes and candied baby carrots ($40). Gallagher’s will also feature festive dishes such as the uber springy pea and mint soup ($9) and strawberry and goat cheese salad ($14) and herb-crusted leg of lamb ($48). Open from 5 to 9 p.m. on Sunday. Lamb is a popular selection for Easter meals, and Sofia Restaurant offers a great selection of Mediterranean lamb dishes — specifically their lamb osso bucco ($36), a braised lamb shank served with spinach orzo and lamb demi-glace. Sofia’s also offers marinated grilled lamb chops ($42) served with fire roasted vegetables. Sofia Restaurant will open at 2 p.m. for Easter Dinner on Sunday, April 21. Beach Plum Farm will host an incredible farm-to-table Easter Buffet. Enjoy the farm’s own fresh eggs, meats, vegetables and herbs while you take in the beauty of life on a working farm. Seatings will be at 10 a.m., 11 a.m., noon and 1 p.m. The buffet is $40 for adults and $15 for kids 4 to 12, plus a service charge and tax. There will also be spring storytelling for the children at 12:30 and 1:30 p.m. Reservations are required. Some traditions are just about a feast, but when that feast includes something as stupendous as lobster tail, well sign us up. Union Park Dining Room is offering a three-course prix-fixe dinner with some delectable first course selections such as tuna tartare, beet salad, bay scallops and others; second course selections include the aforementioned North American lobster tail, an over-the-top duck duet with shaved foie gras, St. Laurent salmon and other items sure to taunt your taste buds for $45 per person plus tax and service. Dinner will be served from 2 to 7 p.m. on Sunday, April 21. Located at 727 Beach Ave. in Cape May. For more information call 609-884-8811 or go to UnionParkDiningRoom.com. Get our Best Bets at the Jersey shore delivered to your inbox every Wednesday, just in time to plan your weekend!